Digital technology has transformed each and every industry in today’s era. It becomes a need of the hour. Higher Education sector is no more lagging behind in adopting these disruptive technologies. Digital Technologies in form of digital marketing, social media interaction is very prominent ways to reach the audience and interact with a large number at a point of time. The ongoing interaction basically leads to higher engagement side form the aspirants and gives the source to convert into probable applicants for admissions. Creating a separate brand image of PGDM Executive to a global audience. Create an engaging social media page substantiated with knowledge resources acclimatized in the course. 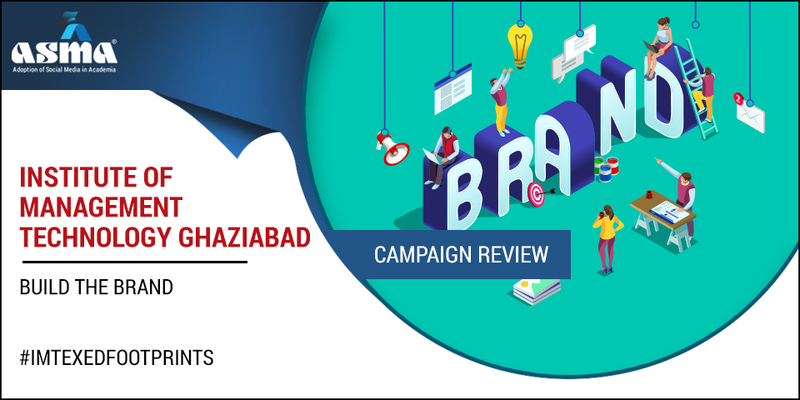 Run a campaign to highlight the benefits of the One-year MBA program at IMT Ghaziabad. Collect testimonials from Alumni and post in social media. Post about events in Pagalguy, Quora, OneYear MBA educational sites redirecting to IMT PGDM Executive page. Monthly newsletter with a summary of all events and activities, mailed to HR professionals and Alumni. To Promote and increase IMT PGDM Executive brand value by organizing various industry connect series like Expanding Horizons, Leader Speak Series and Contemporary Issues in Management, attended by eminent Industry stalwarts. Each event had pre-campaign and post-campaign. Information influx from relevant industry leads to the poster and content creation. They have faced challenges since the social media handles across LinkedIn, Twitter and Facebook were infant started in March 2018, it was an uphill task to gain followers and audience engagement. The opportunities were there with increasing advent of instant gratification for visual representations and story-telling, handles on Instagram and BlogSpot need to be explored to attract more audience. Created a social media buzz about the theme of the event by posting teasers and inviting people online to share their thoughts on the topic, either in twitter by tweeting with #IMTExEdFootPrints or posting on comments thereby engaging more people. Introduced Industry Speaker to the social media by posters and tweets. Described the industry experience of the speaker, such that people from diverse sectors are targeted for the event. Send a “Thank You” Email to the Industry Speaker highlighting the importance of the speech and requesting to follow the Social media pages of IMTPGDMEx for supporting further activities and knowledge resources. Facebook posts were flooded with learning in the classroom. Inviting various eminent personality for guest lectures and post-event day photos, showcase the achievements and learning of the class. The twitter posts are also unloaded with pre and post event promotional strategy. The pre-event promotional strategy contains the warm welcome note for speaker and guests on Twitter. Increase the engagement of the class by tweeting about the event and invoking queries about the topic. Tweet important quotes, liners elaborated by the speaker. Create an engaging question and attract more tweets. Post-event promotional strategy on twitter was to extend warn note of thanks for coming to the event and making the event successful.